Barca! [sob] Barca! [sniff] BAAAARR-CA! I’ve been back in an unusually frigid Van Rock City this week, but part of me remains in the wondrous city of Barcelona, where it was my privilege to spend more than a month with my family while working with the Universitat Oberta de Catalunya. I’ve been mulling for some time how I can begin to sum up this experience in a blog post, and as I so often do when faced with such a challenge I have to admit defeat. I simply can’t express how fortunate I was to share time with these people in this place. I’ll try to blog a few short posts between now and the new year articulating some of what I’ve learned, or been prompted to begin thinking about… There is some fantastic work happening at the UOC that I hope I can whoop up. And I read a few fine books. And there are too many people to thank — both at the UOC, and the people in my network who enabled me to make some sort of contribution. But I would be remiss if I didn’t single out my host Julià Minguillón. It was Julià who invited me, who framed my work. Our workdays mainly consisted of dialectic workouts, often incredibly intense, but always provocative and rewarding. We filled a lot of white boards, entertained a lot of ideas. We argued without malice or ego. I learned lessons about my field, about Catalan culture, about ‘real food’, and a whole lot more… We shared memorable and long lunches, and daily train commutes. Though his English is superb, he patiently endured conversations in my tortured Spanish (which is much improved as a result). And at the end of our sojourn he took us into his home and made certain our final day in Barca was a special one. I am pleased to have some ongoing work to do with Julià, as I would be saddened to end this collaboration. 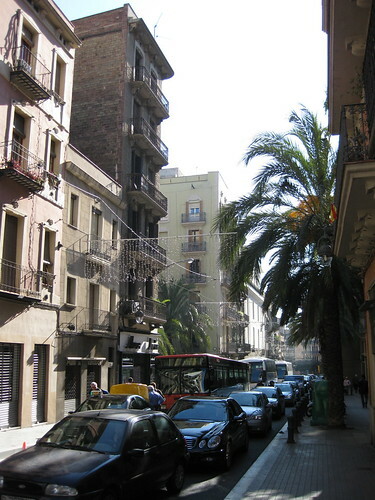 Barcelona, I would like to flatter myself, and imagine that I have been forever changed by my time with you. That I will be able to summon your beauty, your charm, your energy, your intelligence, your spirit of resistance. That I will carry a piece of Barcelona with me for the rest of my days. That I will return to you, again and again. I can only hope these vanities carry some truth. 3 Responses to Barca! [sob] Barca! [sniff] BAAAARR-CA! It was fun to follow along on your Flickr photos — looked like an epic trip.